The two outstanding books in this range, Teach Driving in 3D and Learn Driving in 3D, are now available through Ideas4ADIs. makes this a visually stunning combination that will capture the imagination of learner drivers. This 50 page, A4, wire-bound, laminated teaching aid for ADI use. It equips instructors with a professional and up-to-date teaching aid to help introduce and explain a wide range of driving skills and procedures. The book also acts as a learning aid for pupils, whether they be provisional or full licence holders. 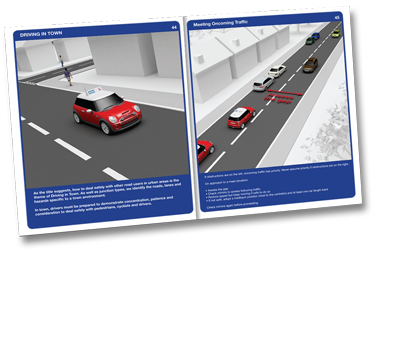 It brings to life the most important aspects of the driving syllabus by uniquely employing 3D drawings and photographs which help with pupil understanding. With the exception of “On the Move” the subject content is not listed in a rigid teaching sequence, for instance, it is not desirable for all manoeuvres to be taught together. Instructors should use their experience and decide in which order to teach based on their pupil’s requirements and driving ability. Dry – wipe pens can be used in order to make extra notes or drawings. A sketch pad is provided at the back of the book to create scenarios of driving situations. "This product is in many ways superior to my current visual aids, is easy to use and with very clear pictures." Stand out from the crowd and offer all your pupils the Learn Driving in 3D book as an incentive to sign-up with your school. At our special bulk-buy price it's less than £4.75 per copy, including delivery! That means you save over £7.00 per copy! So, whether you include the book as part of a learning package for new pupils, or offer it to pupils at a discount, you are quids in! 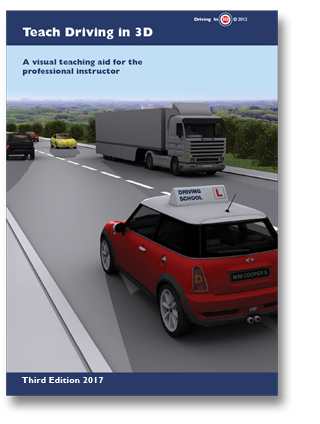 This 100 page, full colour book covers the complete learning to drive programme and explains in detail how examiners conduct driving tests. This exciting and innovative tool employs the latest 3D graphics and pin-sharp animation. All elements of the test are covered from junctions to dual carriageways and includes the reversing exercises. See description above for more details on this publication. over complicate things, and as such is almost twice as thick. This is such a nicely laid out book, and professionally bound. Many thanks!"